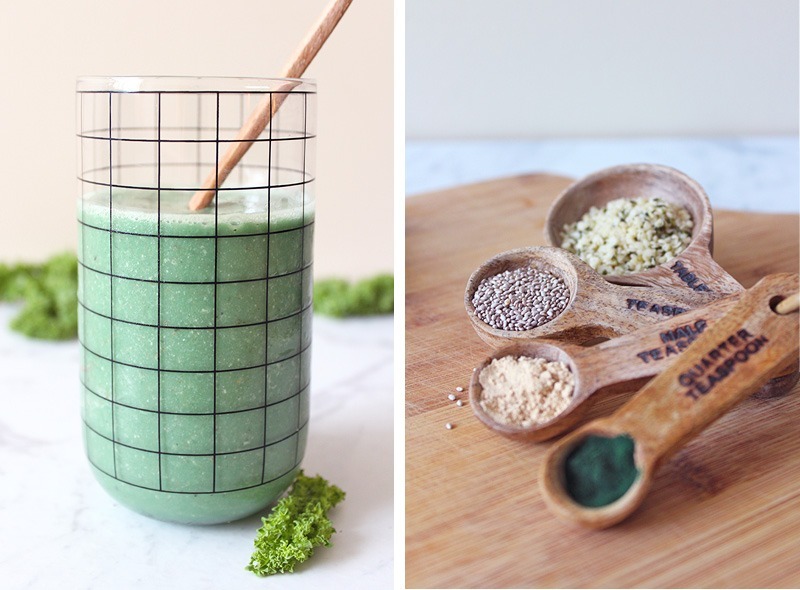 This Green Energy Smoothie is not only refreshing, sweet and delicious, but it will keep you satisfied and energised for hours! The reason I named this smoothie an ‘Energy Smoothie’ is that every time I drink one for breakfast, I am completely satisfied until lunch. 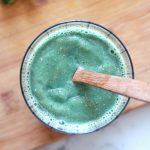 This smoothie lifts my mood and energy levels significantly so that I can work all morning without losing focus and feel happier towards the end of the day! 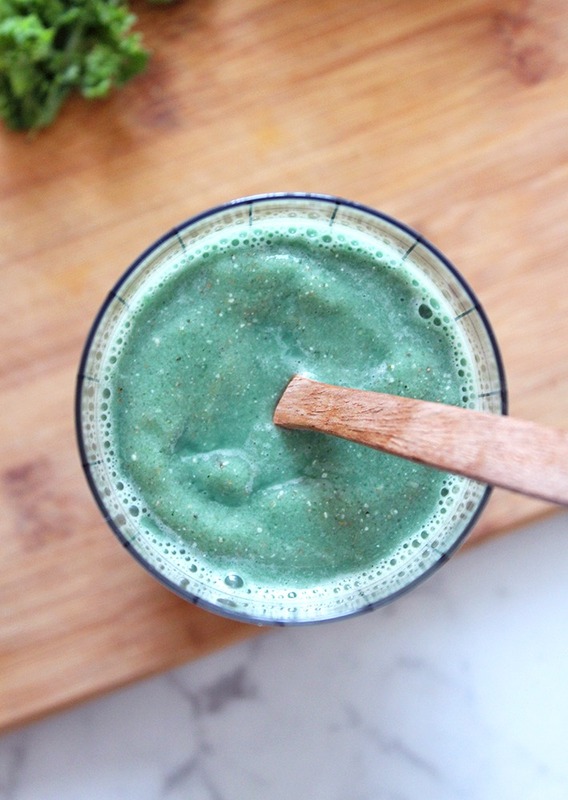 Unlike most green smoothies that are packed with spinach, kale, celery and taste quite strong (nothing against those smoothies at all), this smoothie is subtle, light, icy and sweet. Don’t get me wrong though, it’s not so sweet that it’s overbearing first thing in the morning, just naturally sweetened by the banana. Now, on to making the smoothie. A little tip: always keep a couple of bananas in your freezer! It’s not ideal when you feel like a smoothie and realise that you have no frozen bananas and to be honest, this smoothie is just not the same with an unfrozen banana! If that doesn’t make me sound like enough of a perfectionist, this will. You have to put your ingredients into the blender in the correct order. It goes banana, water, ice and peppermint extract. Then powders. Then seeds. Putting liquid in before any powders or small seeds means that they won’t get stuck to the bottom of the vessel and will instead be evenly distributed throughout your smoothie. Seeds, particularly chia and flax seeds, go in last to prevent them from becoming gelatinous before you blend them. 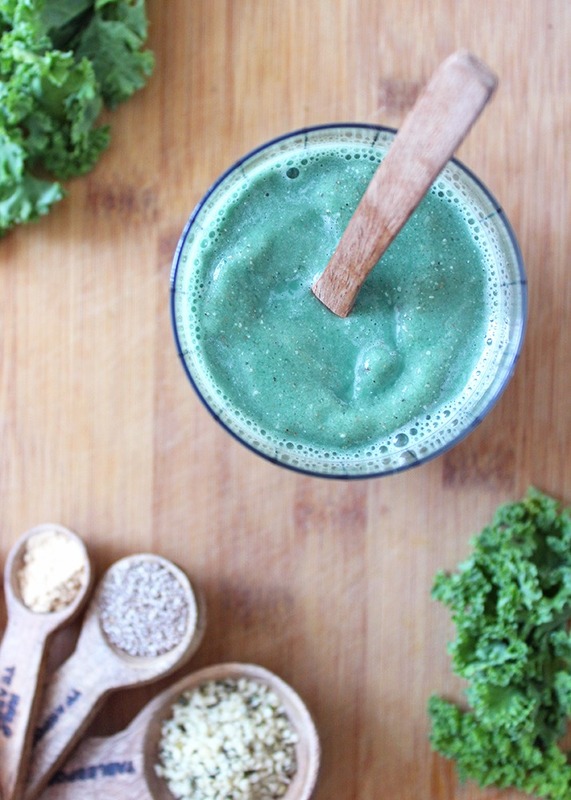 However, if you like chewing on chia seeds then go ahead and mix them into the smoothie after it’s been blended. Why not create a textured bowl by adding granola, coconut chips and cacao nibs… Yum! If you make this recipe and decide to share it on Instagram, don’t forget to tag me @lemonthy.me, I love to see your recreations! Also feel free, as always, to leave any questions, comments or suggestions below. Peel a ripe banana and pop it into the freezer at least 3 hours before you make your smoothie to allow it to become frozen. Tip: always have a couple of bananas in the freezer so you can make a smoothie whenever you’d like. 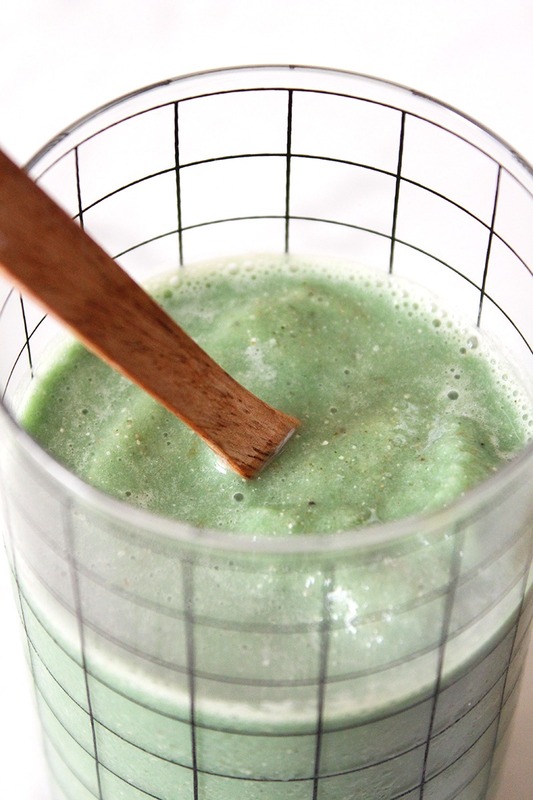 Put your ingredients into a blender in this order: frozen banana, water, ice, peppermint extract, powders, then seeds. Blend your smoothie for approximately 4 minutes or until there are no longer any frozen banana chunks and enjoy!